The Chuckit! Paraflight Frisbee is the perfect toy for endless games of fetch. Designed to last for many play sessions, the Chuckit! is aerodynamic and developed for long-distance flight. This frisbee is made from nylon and rubber and is incredibly buoyant in water, so you can take it to the beach or the lake. It comes in two sizes, small (6.5 inches) and large (9.6 inches), so it’s great for breeds of all sizes. It’s also lightweight, so it’s comfortable for carrying and fetching. Owners say they love that the ChuckIt is easy to toss, and gets a lot of distance without requiring much effort. Some reviewers say it doesn’t hold up well against excessive chewers, but replacements are low-cost and worth it. If you are hunting for a great all-around frisbee for hours of play, you’ll love the Chuckit! If you’re the dog parent to an intense chewer, you probably know the pain of splurging on a new dog toy only to find it ripped to shreds a few days later. 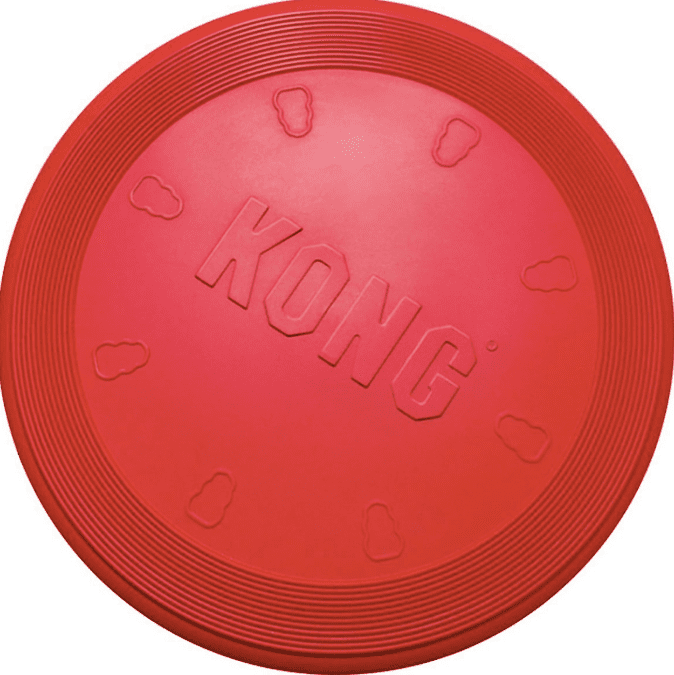 The KONG Rubber Flying Disc is one of the most durable frisbees on the market, designed to hold up against even the most aggressive chewers. Even if your four-legged friend has managed to chew through every other plastic toy, the KONG is up for the challenge. Made from KONG’s classic non-toxic rubber, this disc is strong but still flexible enough to be comfortable for all-day play. The large frisbee is 9” around and designed for dogs up to 85 pounds, while the small size is 7” and perfect for pups up to 45 pounds. Dog enthusiasts say the KONG is one of the best investments they’ve made for their pup. Not only does it provide endless exercise and bonding, but you won’t have to replace it after a month or two of use. Interested in reading more reviews? Take a look at our selection of the best dog chews. Dogs of all sizes enjoy a good game of fetch, but large frisbees can be unwieldy for smaller breeds. We love the UpDog frisbee for smaller pups because it’s only 6” but still durable enough for chewers. Made from soft, flexible rubber, the UpDog frisbee comes in five different bright colors, making it easy to spot in high grass and low light. The smaller size fits well in tiny and medium breeds’ mouths, and the curved edge makes for comfortable carrying. Free of harsh chemical rubber smells, the UpDog is non-toxic and safe for your dog. Dog owners say the UpDog is a great frisbee for their miniature canines. The soft rubber is durable and holds up well time after time. A couple of owners note that the frisbee is heavier than others, making it difficult to throw long distances. Looking for more options for your small dog or puppy? Check out our guide to the best chew toys for puppies. If you have a large pup who loves running and jumping, you need an easy-to-toss frisbee that will soar through the skies. The Chuckit! Flying Squirrel is designed with your runner in mind, built to fly through the sky for yard after yard. Made from durable nylon and rubber, this toy is unlike any other flying disc. It’s shaped like a flying squirrel and comes in three sizes. The large size is 11” and perfect for large and extra-large breeds. It floats in water and is easy to clean after a long day at the park. Reviewers say that the Flying Squirrel can take a little bit of getting used to, but once you get the toss down just right it truly flies through the sky, leading to hours and hours of fun. Just because the sun’s gone down doesn’t mean your pup’s excess energy has as well. The Nite Ize Flashflight Discuit Frisbee is filled with bright LED lights, so you and your dog can see the toy, even in the dark. The lights change colors as the disc soars, creating an entertaining color spectrum in the air. It’s important to note that the frisbee takes two lithium batteries (included) which are protected with a dog-safe cover. Each disc is 8.2” and made from a hard plastic that’s lightweight and easy to throw. Each product comes with a replacement guarantee if you’re unsatisfied with the product for any reason. Reviewers say the ability to play fetch with their pups long into the night makes the Nite Ize a great buy. Some do note that it doesn’t hold up to aggressive chewers as well as other flexible rubber toys, but it’s a fun novelty product that’s well worth the price tag. Take a peek at some of the other best dog toys you can buy. Make your next game of frisbee an unexpected feast for your dog’s ears with the KONG Squeezz Ring Toy. They’ll love the victorious squeak when they make a catch, adding a whole new dimension to games of fetch. The toy can either be tossed or bounced, with an erratic style that keeps pups engaged. It’s made of durable, non-toxic material, and the hidden squeakers will continue working even if your dog punctures one part of the toy. It’s sold in both medium and large sizes and comes in a variety of fun jewel tones (the color is randomly selected upon shipment). Customers write that dogs love their newly squeaky games of frisbee thanks to the KONG Squeezz Ring Toy. While it’s not made for long, gliding tosses like a traditional frisbee, it’s great for games of fetch, and the squeakers generally hold up even with aggressive chewers (although they’re not indestructible). Is your regular game of frisbee feeling a little one-note? Turn your next game into a combination of fetch and tug-of-war with the Outward Hound Bionic Toss N’ Tug. This frisbee has a unique design with a set of handles across the middle, giving your dog an extra challenge when they bring the frisbee back to you. The design also allows the frisbee to float in the water, but it’s as strong as it is lightweight, holding up through countless rounds of both tugging and tossing. The smart use of negative space also gives your dog multiple options for carrying, although some customers mention that it’s quite flat and can be slightly challenging for some to pick up from a similarly flat surface. The Outward Hound Bionic Toss N’ Tug is sold in three colors (purple, green and orange), and owners write that it holds its shape surprisingly well over time. It’s highly aerodynamic and much more versatile than a traditional frisbee. It just might be your dog’s new favorite toy. If you’ve got multiple dogs (or just want a backup frisbee on hand), it's easy to buy frisbees by the pack, saving you a repeat trip to the store in the future. The Hyper Pet Flippy Flopper Frisbee is popular on its own, and it’s also sold in packs of five. Each one is made with soft rubber and durable nylon, which is both safe for your dog’s teeth while holding up over extended use. The frisbees are lightweight and float in the water, making them great for a day at the beach—or a multi-dog pool party, for that matter. Each Hyper Pet Flippy Flopper Frisbee is 9” in diameter, and customers write that they’re a “flippy flopper fan for life” after testing out the toy with their pups. While the cloth-covered rubber isn’t going to be as strong as a KONG product, for example, the nylon is sturdier than you’d expect (and anyway, you’ll be getting a pack of five of them).